This unit comes with one 4 GB DDR3L-1600 RAM chip. Upgrade now to get an 8 GB chip at a discounted price. This system includes 2GB of DDR3 memory, 32 GB of primary storage, and a licensed installation of Windows 10 Home at no additional charge. Featuring 6th Gen Intel® Celeron® processors and support for up to 8 GB of high speed DDR3L RAM, you can get the memory you need to stream media, edit photos, or create projects. With 4 USB 3.0 ports, you can use a USB keyboard, mouse, and camera and still have room to charge your devices. Access your digital life out of the box with the latest Intel® Dual Band Wireless-AC 3168, Bluetooth 4.2, and Windows 10 Home pre-installed. 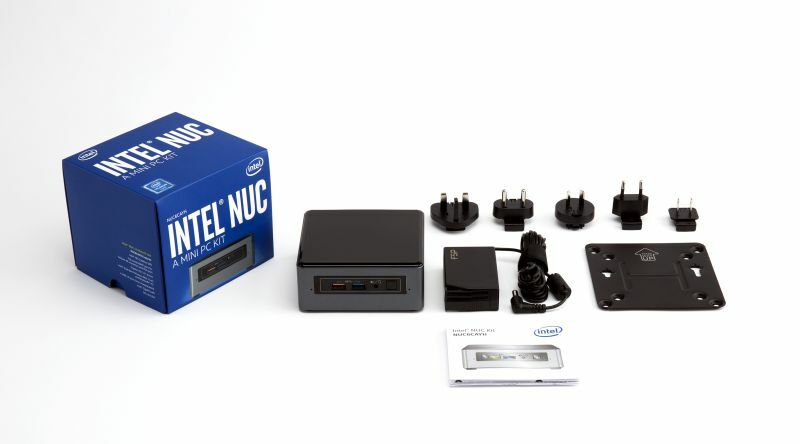 Connect your Intel® NUC to any device for rich visuals and stunning audio.